Following on from our defibrillator article, we thought we would highlight the CPR guide as a reminder to our First Aiders. Remember to follow DRAB …..
D – Danger – Check the scene for immediate danger. Make sure you’re not putting yourself in harm’s way by administering CPR. Is there a fire? Is the person lying on a roadway? Do whatever is necessary to move yourself and the other person to safety. R – Response – Assess the victim’s consciousness. Gently tap his or her shoulder and ask “Are you OK?” in a loud, clear voice. If he or she responds agreement “Yeah” or such, CPR is not required. Instead, undertake basic first aid and take measures to prevent or treat shock, please in recovery position, and assess whether you need to contact emergency services. If the victim does not respond, continue with the following steps. A – Airway – Open the airway. Place the casualty onto their back. Open the airway using the head-tilt chin lift method. (place your hand on their forehead and gently tilt back the head; with your fingertips under the point of the casualties chin, lift the chin to open the airway). B – Breathing -After opening the airway look, listen and feel for normal breathing for no more than 10 seconds. Helpful Hint Noisy Gasps In the first few minutes after a cardiac arrest, a casualty may appear to fit and may be barely breathing or taking infrequent, slow noisy gasps. Do not confuse this with normal breathing. If in any doubt that breathing is normal, act as if not breathing normally and prepare to start CPR. The more people available for this step, the better. However, it can be done alone. Send someone to call for emergency medical services and return back to you to let you know they have done this. If you have another person send them for the AED. Cardiopulmonary resuscitation (CPR) should be administered to a casualty who is not breathing normally and who shows no signs of life. CPR is a method of combining chest compressions with ‘effective rescue breaths’ in order to artificially circulate blood and to put air into the lungs. The depth of compressions for an adult is 5–6 centimetres. The rate of compression should be 100–120 compressions per minute. 30 chest compressions should be administered prior to moving on to breaths (called ‘expired air ventilation’). After completing 30 chest compressions, two effective breaths should be administered directly into the casualty’s mouth. 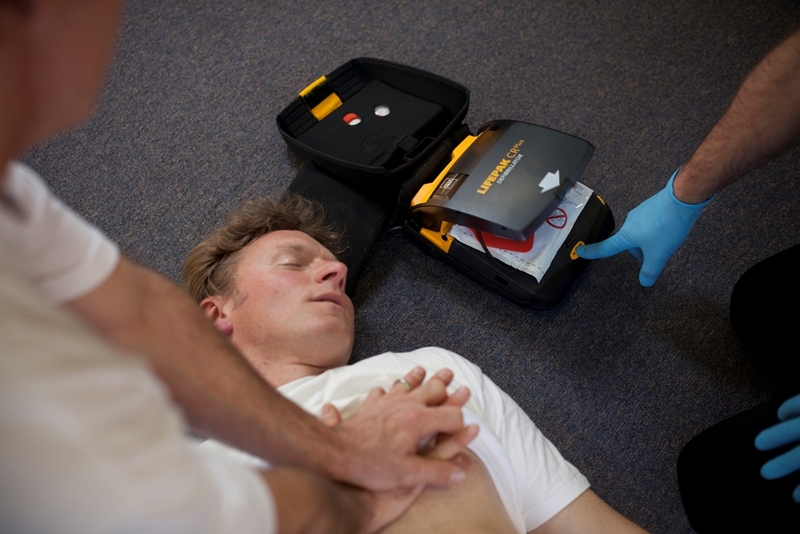 Each breath should take one second to complete and the casualty’s chest should rise as in normal breathing; this is known as ‘effective rescue breathing’. Turn your head and watch the chest rise and fall, then administer the second breath.